You can get ringing notes, rich tones and textures simply by retuning your guitar to an open chord. 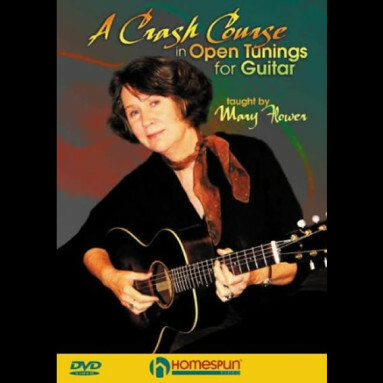 On this easy exploration for novice players, Mary Flower teaches some tunings that will help you play beautiful sounding songs and instrumentals almost immediately. An expert player and an experienced instructor, Mary helps you work out well-known songs or instrumentals for each tuning. She starts with a simple one -dropping the bass E string to D – and teaches a basic but lovely fingerpicking version of the folk hymn, I’ll Fly Away. You’ll then learn how to get into open G, G6, D and D minor tunings. Along the way, Mary shows how to embellish your guitar work using various chord positions, scales, harmony lines, hammer-ons, pull-offs and other essential techniques. Songs include the traditional instrumental, Spanish Fandango; the powerful folk tune John Henry; a “carnivalesque” tribute to Bo Carter; and gospel/spiritual songs Amazing Grace, I shall Not Be Moved, Do Lord and Jesus Is On the Main Line.